Description: Lead engine on UP's Z-LCNS-29. Tried to push the speed to 400 ISO on these late in the day shots, and ended up with a rather grainy effect for these shots. Description: Westbound expedited intermodal, NS Memphis TN to Los Angeles CA, passing CP T260 on the UP Baird Sub. This is a great location for taking photographs, as wesbound trains are heading up a grade, therefore they are not making track speed. Description: Westbound on the UP Jeff City Sub. Description: UP 5109 leads 2237 and 4532 out of Evansville headed to Indianapolis. Description: Headed south over some blooming cotton at County Line Road is UP Train ZYCLD 04 with an ex-UP, nee-MP SD40-2 trailing. 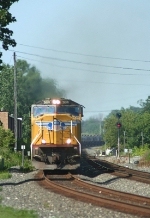 Title: UP 2001 with UP 5109 going west. Description: UP 5109 leading it train of new autos East. Description: A manifest freight bypasses Tower 55 en route to Davidson Yard. This freight had five units but only 5109 was working. Working quite hard judging from the sound and the heavy exhaust.